The original images on Footnote are incredible. Everyone agrees on that. Every time you think you’ve finished a high-level review of the contents in the categories on Footnote, another two million images are added. 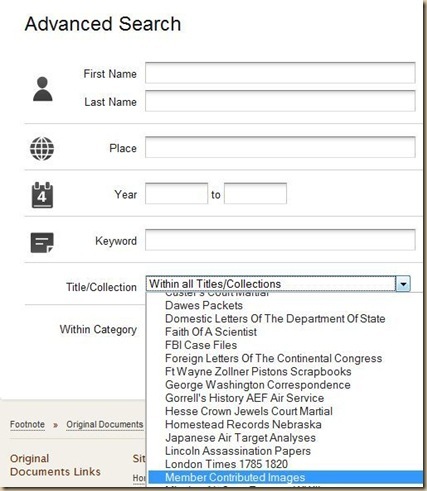 While we all revel in the original documents on Footnote, not as many of us researchers take advantage of the documents and photos uploaded by other members. We see some of them when they briefly show up as a Spotlight, but there are hundreds of thousands that are uploaded and but are never spotlighted by members. 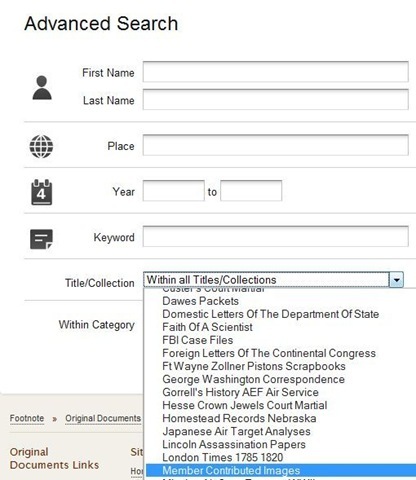 You owe it to yourself to search for items of interest in the member submitted category. The image topics there are as varied as the interests of Footnote members. To look for Member Submissions, just click on the down arrow on the Search button and choose ‘Advanced search’. In the Advanced search window, enter the information you seek in any combination… full name, surname, place, year range a keyword or all of the above.Near the bottom of the window, choose “Member Contributed Images” from the drop-down list to limit your search specifically to that category. The results of your search may be a rare family photo like this photo of the Kornhauser family posted by member leokeil. You may find a great letter like this one that was posted by member markgilchrist. It could be the French birth certificate of Hubert Dominic Cardini that was posted by member RCardini. Member contributions are an excellent way for individuals with common interests to share their ‘finds’ with each other and the Footnote community. All of us who post to Footnote need to remember to name our images with intelligent names so they can be found in a search. We also need to annotate the key items in them to enhance the content descriptions so they are included in search results. What treasures lie undiscovered by others in your Footnote shoebox? Share them by making sure enough information is included in the title and annotations so others can find them when they search Footnote. I’d like to respond to your first comments… everytime you’ve finished a review, another 2 million pages are posted. Say I found 208 hits on my first review. Now I run that same search and find 278… another 70 hits from those 2 million pages! Great! But how can I separate out those that I’ve already seen. Unless I am missing some way to do so, I must now go through 278 records, trying to remember which I’ve seen and which are new. Then a few months later, I must do the same with 292 records… and so forth. It will reach the point where new data does me no good because I can’t sort out the new from the old and it is too burdensome to keep going through the ever increasing list of hits. Is there a way to overcome this problem? You might consider setting up a watch for searches that you do frequently. To set up a watch, perform the search and then click the “Watch” button in the upper right area of the search results page. Once the watch is set up, when we add new content that includes matches for that search, we’ll send an email letting you know we’ve added something with a match and provide a link to just the matches we’ve added since your last notification. You make a great point. We don’t have a convenient way to limit search to Footnote Pages from the Advanced Search page. Lee’s tip here was written with images in mind and was posted before we had the current Footnote Page format. Thanks for the suggestion. We’ll see about adding something to the advanced search page to limit a search to Pages. 1. Clicking the “Pages” link in the brown header at the top of the site will take you to a page where you can search only Footnote Pages ( http://www.footnote.com/pages/ ). This will limit the results to Footnote Pages, but not just Pages created or added to by members. It will also include pages that were created from the Social Security Death Index and the World War II Army Enlistment Records that haven’t had additions from members yet. 2. If you click the “Member Discoveries” link in the header and then select the “Footnote Pages” tab, you’ll see a list of the most recent activity on Footnote Pages–new pages created, new things added to existing pages.